Tubing in lazy river and waterslides. No U.S. Passport Required U.S. citizens do not require a passport to travel between the U.S. and Puerto Rico. This may change so double-check with airline. U.S. Dollars Accepted. The currency of Puerto Rico is the U.S. dollar making purchases on the island hassle free. Just a short hop away arrive in Puerto Rico in as little as 2 ½ hours by commercial air from major U.S. cities. Under 4 hours from Boston and New York. Warm Caribbean climate average temperature of 83°F (22.7°C) in the winter and 85°F (29.4°C) in the summer. Puerto Rico beckons active travelers interested in spicing up their vacations! From hiking in a forest, to dining on the infusion of classic and delectable Caribbean cuisine, to romantic walks on a moonlit beach, virtually any type of vacation interest can be accommodated in the land of your dreams, Puerto Rico. Getting to Puerto Rico almost always means flying to Luis Muñoz Marín (LMM) International Airport. The gleaming white terminal located just outside of San Juan is ranked 34th among passenger airports in the United States. Most U.S. and many international airlines offer direct flights to Puerto Rico, and making connecting flights is easy. LMM is one of the largest airports in the Caribbean and is a popular place for hopping over to the U.S. Virgin Islands and other Caribbean destinations. Narrow cobblestone streets, colorful colonial buildings, centuries-old fortresses overlooking the Atlantic Ocean, fascinating museums and art galleries, handcrafts on the corners – and everything bathed by a tropical breeze – these are some of the characteristics of legendary Old San Juan. Wear comfortable shoes and light clothing, grab your camera, and get ready to marvel at the perfect marriage of the past and the present on the very lived-in streets. A walking tour is a wonderful way to get acquainted with the Old City. If you need a break, hop aboard the no-charge trolley cars that make the rounds to and from La Puntilla and Covadonga parking lots at one of the clearly marked stops. La Casita – Your Old San Juan adventure begins at La Casita, or The Little House, the yellow building located in Plaza de la Dársena that houses a Puerto Rico Tourism Company Information Center. Open Mon. through Wed. from 8:30 AM to 8:00 PM; Thur. and Fri. until 5:30 PM; Sat. and Sun. from 9:00 AM to 8:00 PM. There is an outdoor crafts market around the building that is open Sat. and Sun. from 9:30 AM to 10:00 PM and Mon. and Tues. from 11:00 AM to 9:30 PM. The crafts market schedule may vary according to cruise ship itineraries. Tel. (787) 722-1709. San Juan Bay – La Casita overlooks San Juan Bay. It is the busiest ocean port in the Caribbean, bringing in half of the region’s trade and over one million cruise ship visitors a year. Bayside shops carry everything from gold jewelry to island arts and crafts. At Casa Don Q Puerto Rico, located across the street from Pier 1, you can learn about Destilería Serrallés, a rum distillery established in 1865… and sample its award-winning products. La Muralla – As the promenade continues, it follows the curve of the bay and leads you to La Muralla, or city wall. Built mostly between 1539 and 1641 using sandstone blocks up to 20 feet thick, the wall was completed in 1782. It protected the city against enemy attacks. At the western mouth of the bay you will see Isla de Cabras (Goat Island), and a small Spanish fort built in 1610. Museo de Doña Fela – From La Fortaleza, go to Recinto Oeste Street and turn right on Caleta de San Juan Street. There you will find Museo de Doña Fela, the original residence of Felisa Rincón de Gautier, the first woman to become Mayor of San Juan. This museum features personal belongings, period memorabilia, and awards granted to this exceptional woman. Open weekdays from 9:00 AM to 4:00 PM Tel. (787) 723-1897. Casa Rosada – The lovely house in front of La Rogativa is Casa Rosada, or Pink House. It was built in 1812 for the Spanish army and is now a day care center for government employees’ children. Plazuela de la Rogativa – From Museo de Doña Fela, return to Recinto Oeste Street and climb the hill to reach Plazuela de la Rogativa, a small plaza with a bronze sculpture by Lindsay Daen. The work recreates the day a bishop and his companions frightened away British troops during a 1797 attack on the city by carrying torches and chanting. The enemies thought the procession was local troop reinforcements. Casa Blanca – Take the upper road along a plant-decked wall to a doorway above Casa Rosada. This is one of the five entrances to Casa Blanca, or the White House. For 250 years it was the residence of the descendents of Juan Ponce de León, the first governor of Puerto Rico. The house is now a museum of 16th and 17th century family life and houses a miniature replica of a Taíno village. The garden is open daily from 8:00 AM to 5:00 PM. Entrance fee is $2.00 for adults and $1.00 for senior citizens and children. Tel. (787) 724-1454. Fuerte San Felipe del Morro – Exit Casa Blanca through Recinto Oeste Street. Straight ahead is Fuerte San Felipe del Morro or El Morro fortress, rising majestically 140 feet above the sea. El Morro (meaning “promontory” in Spanish), surrounded by the Atlantic Ocean and San Juan Bay, is the most striking of the city’s military fortifications. It was built between 1540 and 1783 to protect San Juan from attack by sea. Among its many attractions is a maze of secret tunnels and dungeons, and a small museum with information on its history. Along with San Cristóbal Fort, El Morro has been designated a National Historic Site and is part of a World Heritage Site. It is administered by the U.S. National Park Service. Open daily from 9:00 AM to 5:00 PM. English tours depart at 11:00 AM and 3:00 PM. Entrance fee is $2.00 for adults and $1.00 for senior citizens and children. No entrance fee for children under 12. Tel. (787) 729-6960. Plaza de Hostos – The small square in front of Plaza de la Dársena, near La Casita, is Plaza de Hostos. This square features artisans’ displays, snack stands, and the traditional piragüeros, vendors who sell shaved ice topped with tropical fruit syrups. Paseo La Princesa – Near Plaza de la Marina and a statue honoring the Puerto Rican immigrant, you will find Paseo La Princesa. It is a promenade lined with trees, pocket parks, sculptures, and benches, and leads to a magnificent fountain with a bronze sculpture by Luis Sanguino depicting the island’s cultural roots. La Princesa – Midway through the promenade is La Princesa itself, a former jail and now headquarters of the Puerto Rico Tourism Company. The restored building features a gallery of Puerto Rican art with permanent and visiting exhibitions. Tel. (787) 721-2400. Puerta de San Juan – The promenade leads to the red-painted Puerta de San Juan or San Juan Gate, where you re-enter the city. This is one of six original massive wooden doors that centuries ago were closed at sundown to protect the residents. La Fortaleza – Go through the doorway and make a right on Recinto Oeste Street to La Fortaleza. It is a palatial structure built in 1540 and the oldest governor’s mansion in the Western Hemisphere still in use. Guided tours are available weekdays, except holidays, from 9:00 AM to 3:30 PM; tours in English every hour, in Spanish every half hour. Schedules are subject to change. Proper attire required. Tel. (787) 721-7000, ext. 2358. Bacardi Distillery – The largest in the world, is only a 15-minute drive from San Juan and is one of the most popular visitors’ destinations in Puerto Rico. Visitors are treated to a fascinating guided tour of the facilities at the “Cathedral of Rum.” Everything from the vast fermentation vats to the high-speed bottling machinery is at work and on display. A trolley takes you to the Bacardi family museum, where a history of the product and landmarks in its development are seen. The tour ends at the lofty, bat-like pavilion, which you may have seen if you have gazed across San Juan Bay from the southern walls of the Old City. Here you can sample the world-famous rum and buy souvenirs or a variety of Bacardi products at the gift shop. If you are lucky, your trip may coincide with the annual Bacardi Arts and Crafts Fair, a joyfully crowded, two-day event that features local artists and artisans and plenty of music. If not, vendors are often on the grounds and selections of artisans’ products are always on sale in the gift shop. Arecibo Observatory – In the northwest mountains of the island, nestled among the karst-country hills, is the Arecibo Ionospheric Observatory, or Radio Telescope, the largest of its kind and one of the most important research facilities on the face of the earth. The huge dish-more than a dozen football fields could fit inside-sits in a sinkhole and is forever aimed at the sky, tuned to detect the slightest sounds emitted by the farthest stars. It is the place where planets outside our solar system were discovered and is the home base for NASA’s SETI, the Search for Extra-Terrestrial Intelligence, which you may remember from the Jodie Foster movie “Contact,” part of which was filmed here. In the Visitors’ Center you will see how the colossal structure is used to study radio emissions from distant galaxies, quasars, pulsars and many other cosmic sources. The exhibits are interactive and contain extensive information on astronomy and atmospheric science. It is the impressive size and magnitude of the tiled dish that leaves visitors breathless when they hike to the viewing platform and see it glimmering in the sun. Indeed it is one of the only landmarks in Puerto Rico that can easily be seen from a jetliner passing by at 33,000 feet! The Arecibo Ionospheric Observatory is open Wednesday to Friday from 12:00 PM to 4:00 PM and Saturday, Sunday and most holidays from 9:00 AM to 4:00 PM. From San Juan take Road 22 to Arecibo. In Arecibo, take Road 129 to 134, then Road 635 to 625, which ends at the observatory. Puerto Rico has scores of museums exhibiting everything from millennia-old Indian artifacts to 20th century modern art. The most prestigious collection of fine art in the Caribbean is yours to visit at the Ponce Museum of Art, where you can see the famous “Flaming June”, in addition to a large collection of Colonial period religious art. San José Plaza, San Sebastián St. Ruins of one of the oldest Puerto Rican cities capitalized during Spanish rule. A museum located near the ruins exhibits objects related to the history and colonization of Puerto Rico. Located in a beautiful, spacious house constructed in the neoclassic-criollo style of Spanish masonry, pebbles, bricks and wood. The museum opened its doors to the public in September of 1992. Ponce de León built the original structure in 1521, but died before living there. It was destroyed by a hurricane two years later. The current building was constructed by Ponce de León’s son in-law. Now a museum of 16th and 17th century Puerto Rican life, the second floor also houses a Taíno Indian exhibit. Lush gardens cover the grounds. 51 Caleta de San Juan St. The Francisco Oller Museum, located in Bayamon’s former City Hall, features memorabilia of the city’s history. The Las Americas Museum features a number of exhibits related to the history and culture of the Americas, from the pre-Colombian era to the present. Artists from Latin America, the United States, and Puerto Rico also exhibit their work in our galleries. The residence of Luis Muñoz Marín, this museum features the work of famous Puerto Rican artists. Seminars related to Puerto Rican history and culture are also held here. Devoted to collect, preserve and exhibit works by vanguard artists from Puerto Rico, the Caribbean an Latin America. The museum presents an atractive program of cultural activities. Besides art galleries and workshops the stately red-brick also houses a professional conservation and restoration laboratory, a documentation center with specialized information on contemporary art, and comfortable spaces for leasing, where diverse activities are celebrated. The museum store as well as the spacious inner courtyard makes more pleasant the visits to the museum. Welcome to the MAC! This museum, in an 18th century building in Old San Juan, covers the life and works of the world famous cellist and humanist, Pablo Casals, who passed away in 1973. On exhibit are original manuscripts of Casals’ music, along with his cello and piano, on display in the main hall. 199 Callejón de la Capilla St.
We offer general information about museums, parks, and other cultural places on the island. Created by the Puerto Rico Institute of Culture, the Puerto Rico Indian Museum was developed to help visitors better understand Puerto Rican origins and culture. The collection features objects made by the Taino Indians, including various kinds of vessels, stone and wooden ornaments, canoes, and arrows. The Roig house (La Casa Roig), built in 1919, is one of the most beautiful structures in Puerto Rico. Dedicated to its builder, architect Antonin Nechodoma, the house is now a museum. Corner of Vicente Palés St. The Cautiño family’s collection of Latin, Caribbean, and Puerto Rican art is on display in their house, by architect Manuel Texidor. There are also educational activities and a center for art documentation and investigation. Open Tuesday thru Saturday from 9:00a.m to 4:30p.m., and Sundays from 10:00a.m. to 4:30p.m. Admission is $1.00 for adults, and $0.50 for children and seniors. Birthplace of Antonio Paoli, now a museum of cultural and art objects. We also offer conferences, seminars, and visits to other cultural sites. 29 José I. Quintón St.
14 Antonio R. Barceló Ave. Covering 300 years of Ponce’s history, this museum contains photos and a number of important historical documents and objects. Tours are available in English and Spanish. Open Monday thru Friday from 9:00 a.m. to 5:00 p.m. and Saturdays and Sundays from 10:00 a.m. to 6:00 p.m. (Closed on Tuesdays). Art lovers should not miss the fine collection of more than 850 paintings, 800 sculptures, and 500 prints culled from five centuries of Western art that is featured here. The building alone, which was designed by famed architect Edward Durrel Stone, is worth the one hour-plus trip from San Juan. The Ponce Museum of Art is open to the public daily from 10:00am to 5:00pm. The Serrallés Castle is a magnificent Spanish Revival mansion, built in 1930 for the Serrallés family, owners of the Don Q rum distillery. The antique furnishings recall the era of the sugar barons. A short film tracing the history of the rum and sugar industries enhances your visit. Open Tuesday through Sunday from 9:30a.m. to 5:30p. 2 Rama St., Corner, Dr. Veve St. Located in the town of San German, Porta Coeli Chapel (La Capilla Porta Coeli) is now a museum featuring Puerto Rican religious works including exhibits of wooden saints, ceramics, and crystal objects. White sandy beaches put Puerto Rico and its offshore islands on tourist maps in the first place. Many other Caribbean destinations have only jagged coral outcroppings or black volcanic-sand beaches that get very hot in the noonday sun. Best for Singles: Sandwiched between the Condado and Isla Verde beaches along San Juan’s beachfront, Ocean Park Beach attracts more adults and less of the family trade. Only Isla Verde beach to the east matches Ocean Park for its broad beach and good swimming. The people-watching here is nothing compared to the well-stuffed bikinis (both male and female) found on South Miami Beach or Rio de Janeiro. However, for the Caribbean, Ocean Park is as good as it gets. Because many gay boarding houses lie in Ocean Park, a lot of the beach here is frequented by gay young men, mainly from New York. However, straight people looking to meet someone while wearing swimwear will find plenty of lookers (and perhaps takers). Best Beach for Families: Winning without contest, Luquillo Beach, 30 miles (48km) east of San Juan, attracts both local families, mainly from San Juan, and visitors from Condado and Isla Verde beaches in San Juan. Beach buffs heading for Luquillo know they will get better sands and clearer waters there than in San Juan. The vast sandy beach opens onto a crescent-shaped bay edged by a coconut grove. Coral reefs protect the crystal-clear lagoon from the often rough Atlantic waters that can buffet the northern coast, making Luquillo a good place for young children to swim. Much photographed because of its white sands, Luquillo also has tent sites and other facilities, including picnic areas with changing rooms, lockers, and showers. Best for Teenagers: More families with teenagers check into the Hyatt Dorado Beach Resort & Country Club west of San Juan than into any other competitor in Puerto Rico, including the resorts along the San Juan beach strip. 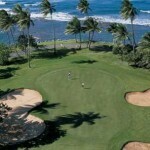 Six beaches border the Hyatt resorts, each a strip of white sand fronting the north coast. Because the Dorado features many activities for kids of all ages, its beaches over the years have become family favorites. 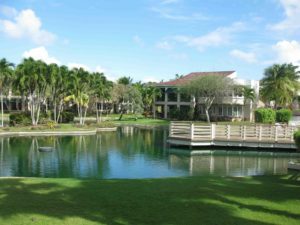 The Hyatt beaches originally opened onto a grapefruit-and-coconut plantation, but today these 1,000 landscaped acres (400 hectares) are devoted to fun, ranging from jogging and biking trails to swimming in the longest pool on the island. Young people find it easy to meet other teenagers here, not only on the beach but while participating in the resorts’ myriad of activities. Best for Swimming: Whereas on much of the northwest coast of Puerto Rico, rough Atlantic waters often deter bathers but attract surfers , the south coast waters are calmer. On the south coast, Playa de Ponce, outside Ponce, Puerto Rico’s second-largest city, consists of a long strip of beautiful white sand that opens onto the tranquil waters of the Caribbean. Less crowded than Condado and Luquillo, Playa de Ponce is an ideal place to swim year-round. Best for Scenery: In the southwestern corner of Puerto Rico, Boquerón Beach lies in a section of the island called the Cape Cod of Puerto Rico. The beach town of Boquerón itself, filled with colorful scenery, stands at the heart of a 3-mile (5km) bay, with palm-fringed white sand curving away on both sides. In addition to this panoramic vista, you can also sample vignettes of local life. Fisherfolk, sailors, and scuba divers are also attracted to this beach, where fresh oysters are shucked on the spot, doused with Tabasco, and sold at various ramshackle shacks. You can see that there are plenty of interesting photo ops at this beach. While enjoying the scenery and the sands, you can take a break and order a regional ice cream at one of the stands. It’s made with sweet corn and dusted with paprika. Sound awful? Try it: It’s good. Best for Windsurfing: Rincón’s winter surf, especially at Playa Higüero, puts Malibu to shame. Today surfers from all over the world are attracted to Rincón, which they have dubbed “Little Malibu.” From Borinquén Point south to Rincón, nearly all the beaches along the western coast are ideal for surfing from November to April. As the windsurfing capital of the Caribbean, the Rincón area was put on the map when it was the site of the 1968 world surfing championships. Some of the 16-foot (4.8m) breakers here equal those on the north shore of Oahu. Best Beaches for Being Alone: The main island is filled with isolated sandy coves that only the locals seem to know about. The best, all guaranteed to delight the escapist in you, stretch between Cabo Rojo (the southwesterly tip of Puerto Rico) all the way east to Ponce. Beginning in the west, directly east of Cabo Rojo, you’ll discover Rosado Beach, Santa Beach, Caña Gorda Beach, and Tamarindo Beach. Access to many of these is limited because of poor roads, but the effort is worth it. Be sure to bring the necessary supplies. Best for Snorkeling: For snorkeling, we prefer to escape from the Puerto Rican mainland altogether, heading for the isolated beaches of the offshore islands of Vieques and Culebra, part of the Spanish Virgin Islands. In Vieques alone there are some 40 beaches, most of them officially unnamed even though U.S. sailors once stationed on the island have nicknamed their favorites-everything from Green Beach to Orchid. The best beach for snorkeling on Vieques is Playa Esperanza, especially that spot in front of the Trade Winds Guesthouse. Another favorite location, which we discovered when directed there by a Navy SEAL, is across the little harbor at Cayo de Afuera. This site gives you the best preview of dramatic (and living) antler coral. Nurse sharks and the occasional manatee also hang out here. On the neighboring island of Culebra, the beaches are less visited by snorkelers, even though they open onto coral reefs and clear waters. The snorkeling is not so hot at the island’s most frequented beach, Flamenco Beach. But all you have to do is take a 15- to 20-minute hike from the parking lot at Flamenco over the hill to Playa Carlos Rosario, which offers some of the best snorkeling in Puerto Rico. A barrier reef virtually envelops the beach, and you can snorkel all day. For other great snorkeling, you can walk along the cliffs south of here for about a quarter mile (.4km) to a place called “The Wall,” which has 40-foot (12m) drop-offs, rainbow-hued fish, and other delights. Disclaimer: Information on this site may not be up to date and subject to change. Please verify the accuracy of the information through your own research!